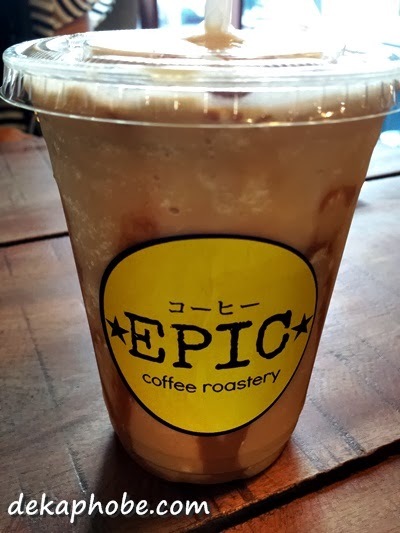 Both words don't really usually combine, but in Epic Coffee Roastery -- or Epic Cafe -- it does. I have visited this Kapitolyo coffee shop thrice and I always get one drink: the Pour Over Coffee (Php 85). The coffee addict that I am, I watch the barista create my drink like a child watching her favorite show. The coffee shop is not exactly small to hole-in-the-wall standards, with wooden chairs and real bikes on display. Not into hot coffee? 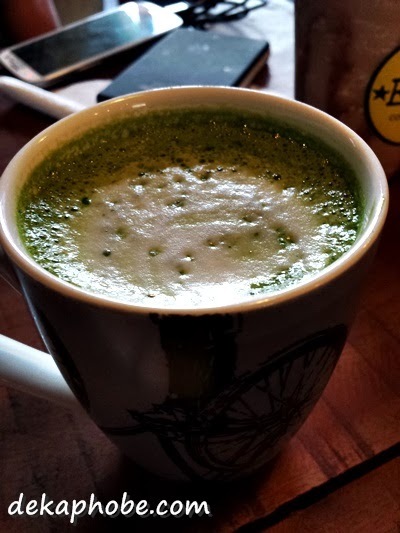 They also serve Hot Matcha (Php 140). Not into hot drinks? They have frappes as well, like the Sea Salt Frappe (Php 145). While I helped myself with a Pour Over Coffee (again), my friends skipped the caffeine and shared these cakes: Belgian Cake (Php 130), Strawberry Cheesecake (Php 160) and Rainbow Cake (Php 195). I loved the Belgian Cake's dark chocolate goodness, this lovely dessert's sweetness is just right that it totally made up the absence of Blackout Cake. Moreover, I loved the Strawberry Cheesecake and the cute Rainbow Cake as well. Like its sister resto, Epic Cafe also has Homemade Ice Cream. I tried the Chocolate (Php 90) while my friend had the Matcha (Php 90). The ice cream has a thick yet flavorful consistency that blew me away. I could finish the whole thing but two people can share a single serving. Other flavors are Vanilla Bean, Salted Caramel, Barako, Earl Grey and Banana Walnut. Friendly baristas, delicious cakes and ice cream, relaxing ambiance, and my Pour Over Coffee. Need I say more? I love cakes! And frappes. Too much of the sweets. Hehe. But i love them. This looks like a nice place to hang out and shoot around. Not with ammos though. OMG I was in Kapitolyo two weeks ago and ate at Three Sisters. I didn't see this cafe, I would love to try it, especially the cakes! Oh, so that's why the quaint cafe is being raved for, sister resto pala sya ng Poco Deli, which never fail to amuse diners. The rainbow cake looks exciting to try.